On Saturday afternoon a friend of mine, Dinie invited me to accompany her seeing a movie of Ainun dan Habibie at the cinema of Borobudur mall, Pekalongan. I said yes I could. After having a meeting at school where I am teaching at about one o’clock, I directly rode my motorcycle to Borobudur Mall. Dinie had been waiting for me there. Yes, that was right, She’d been already there with two tickets for herself and me, myself. When I arrived at the Mall, I asked the security where the cinema was, then I found it on the third floor. 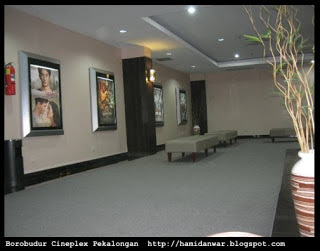 There are two rooms, cinema one and cinema two. Dinie asked me to come into the cinema two. She had been there alone. Firstly I was confused because Dinie brought my ticket. Later, I asked to the guard of the cinema, She suggested me to call my friend, Dinie to get out to give the ticket for me. then, she really got out and gave the ticket to the guard, Dinie pulled my hand and led me to the chair of hers and mine. I finally could sit inside the cinema with her. This was my first time to watch and see a movie. I have never seen such a movie show. There was no cinema at my own town in Batang. Maybe I am a village man and I am far away from the crowded of people and city. I sat beside Dinie. We saw such a wonderful movie titled “Ainun dan Habibie”. This movie is still popular and is warmly talked in Indonesia, a story of BJ Habibie and his wife. His life when he was young and when he studied at Germany. I feel sad due your town, but feel proud of you in sharing the story. Ups, why don't you try to tell about your place. Expose the unique thing thus you gotta feeling proud with it as none city has same stuff there. Yes! Finally something about comfort. I visited several blogs but the audio quality for audio songs existing at this site is really excellent. Generally I don't read post on blogs, however I would like to say that this write-up very pressured me to try and do it! Your writing taste has been surprised me. Thanks, very great post. Howdу! I could have swοrn I've been to this site before but after reading through some of the post I realized it's new to me. booκ-maгking and cheсκіng back frequentlу! Thanks for alway coming here and commenting friend..
You've performed an impressive job and our whole group shall be grateful to you. We're a group of volunteers and starting a brand new scheme in our community. Your site provided us with useful information to work on. You have done a formidable job and our entire community can be grateful to you. That is a really well written article. I will be sure to bookmark it and return to read more of your helpful info. Thanks for finally talking about > "Recount Text : My first experience seeing a movie with Dinie" < Liked it! Look into my web-site - Sac Louis Vuitton [beyonddelay. I'm gone to convey my little brother, that he should also pay a visit this weblog on regular basis to obtain updated from hottest reports. I know I am getting know-how everyday by reading thes pleasant content. however I assumed this publish was great. I don't realize who you might be however certainly you're going to a well-known blogger when you are not already. Hi there! This post couldn't be written much better! Going through this article reminds me of my previous roommate! He always kept preaching about this. I most certainly will forward this article to him. Pretty sure he's going to have a great read.